So sinfully delicious you would think you are having a dessert, but lucky for you (and me) it’s a healthy breakfast! 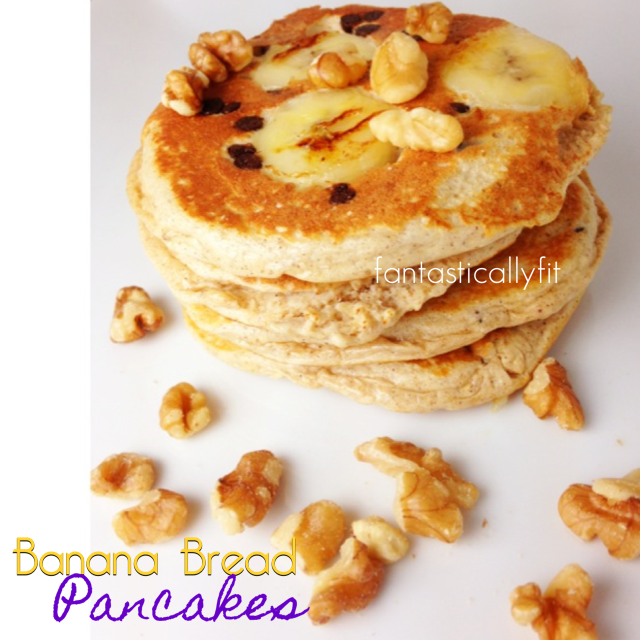 I love banana bread in all forms- muffins, loaves, so why not pancakes? I of course had to add some chocolate chips to make these pancakes extra special! Blend oats in a food processor or blender until fine like flour. Then add in all the other ingredients EXCEPT the chocolate chips, banana and walnuts, and blend until smooth. Fold in 1 tablespoon of the mini chocolate chips. After allowing the pancake to firm slightly, gently place sliced banana and sprinkle other tablespoon of chocolate chips on to the uncooked side of the pancakes. 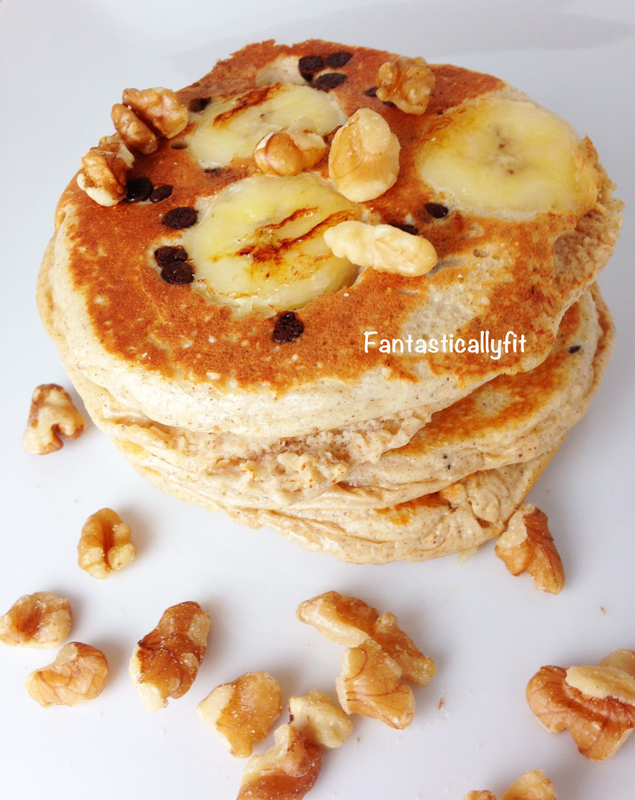 Top with walnuts and maple syrup! I thought they were so good I ate mine plain! 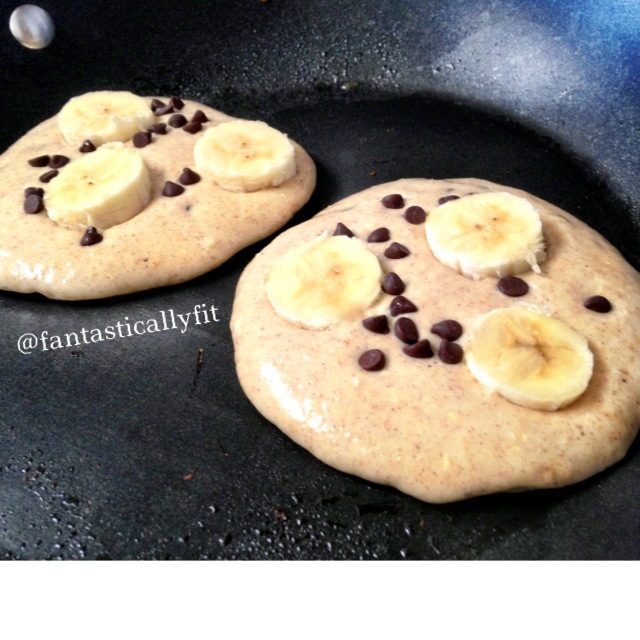 These would be great without chocolate chips too or even with the chips and minus the banana! 8 Responses to "Chocolate Chip Banana Bread Pancakes"
Hi is it necessary to put the butter, nutmeg and cinnamon ? Hi Amy, did you get your butter extract and the chocolate chips from vitacoast.com? The chocolate chips are from vitacost.com, but I get the butter extract from the local market in the baking aisle. What do you suggest as a substitute for the Vanilla Whey Protein? This recipe was created using whey and I haven’t tried it any other way. But, you increasing the flour could work. You would also want to increase the sweetener as well.